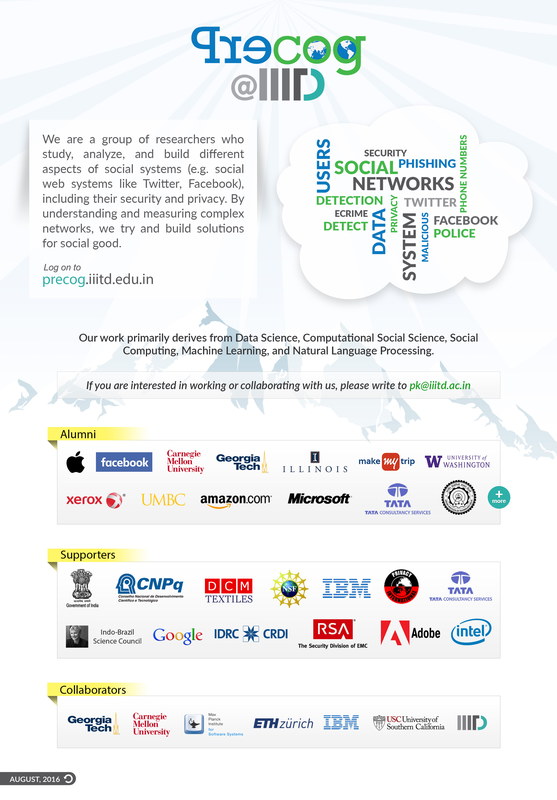 is a group of researchers who study, analyze, and build different aspects of social systems (e.g. social web systems like Twitter, Facebook), including their security and privacy. By understanding and measuring complex networks, we try and build solutions for social good. Our work primarily derives from Data Science, Computational Social Science, Social Computing, Machine Learning, and Natural Language Processing. April 2019: Popular hashtags (frequency, temporal), popular mentions, 1st tweet, 1st Inked tweet, popular locations, #GotInked tweets, #FirstTimeVoter analysis, constituency vs candidates. 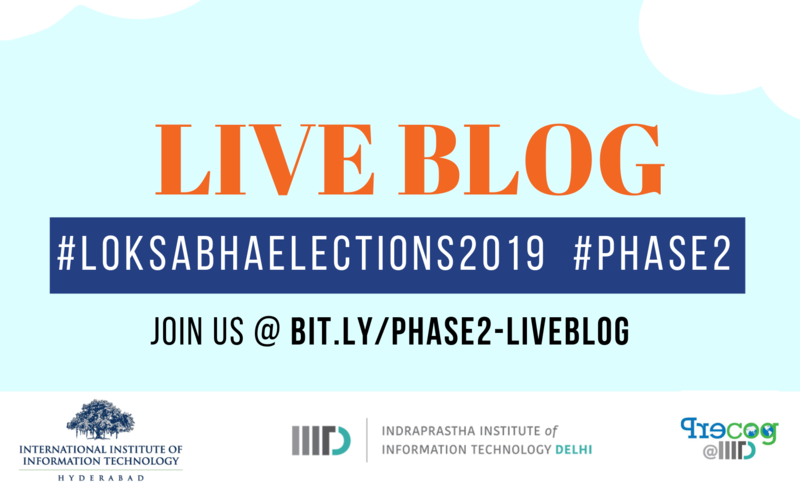 Our analysis of #Phase1 #LokSabhaElections2019! April 2019: Our comprehensive analysis of Social Media presence of @narendramodi & @rahulgandhi. "NaMo Vs RaGa: On Twitter, YouTube Facebook Instagram and LinkedIn"
April 2019: Our work on #LokSabhaElections2019 and MIME was recorded for Aaj Tak. Pics. April 2019: Paper "What Sets Verified Users Apart? Insights, Analysis and Prediction of Verified Users on Twitter" Accepted at 11th ACM Conference on Web Science. April 2019: Rishabh receives travel grant to participate in the CSS Summer School in Berlin July 21 - 27, 2019. April 2019: Paper "Signals Matter: Understanding Popularity and Impact of Users on Stack Overflow" Accepted at The Web Conference (formerly known as WWW), San Francisco, May 13-17, 2019. Paper | Code | Dataset. April 2019: Paper "Travel time estimation accuracy in developing regions: An empirical case study with Uber data in Delhi-NCR" Accepted at AW4CITY Workshop, TheWebConf, San Francisco, May 13-17, 2019. Paper. April 2019: Shrey & Divyansh #PrecogAlums receive 'J.N. Tata Endowment Scholarship for Higher Education' 2018 - 2019 for pursuing their graduate school. April 2019: PK gave a talk on Selfie Deaths & #Elections2019 as part of Savishkar 2K19, a start-up oriented event at Rishi M.S Institute of Engineering & Technology for Women. 100+ participants. Pics. 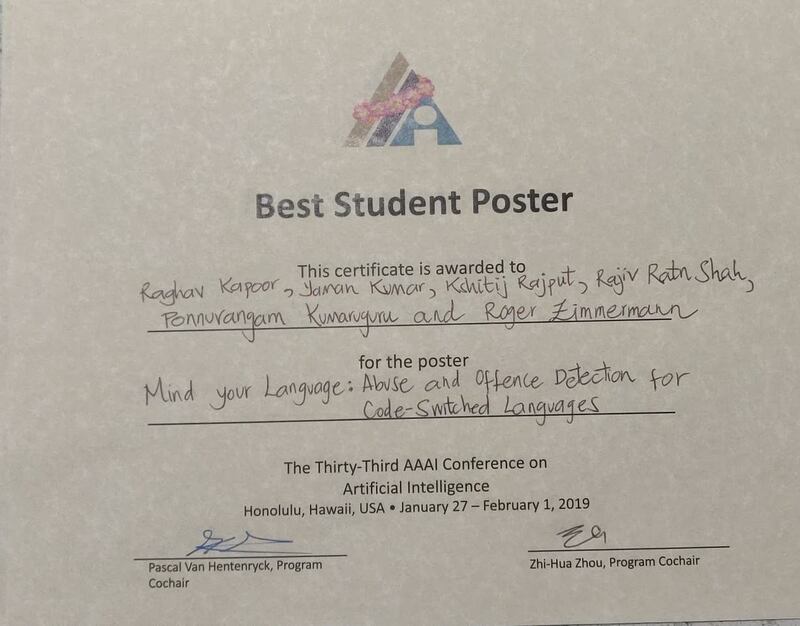 April 2019: Elated to bag runner up position for best student paper award at 10th International ACM Web Science Conference. Full Paper. 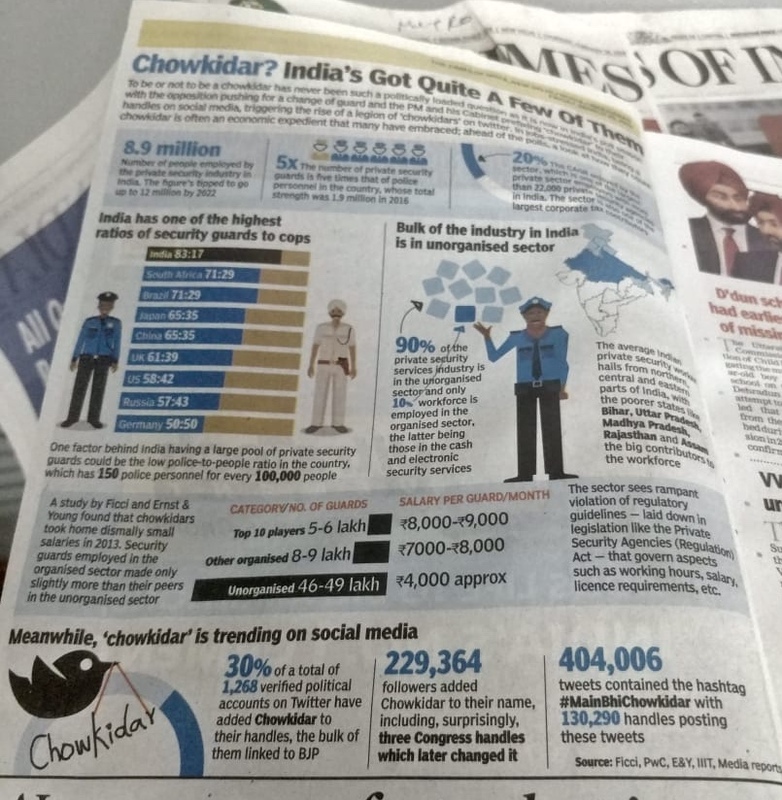 March 2019: Front page infographic, The Times of India, March 30 featured Our work on #MainBhiChowkidar Physical paper. March 2019: PK gave a talk on "Social Media for Central Banking / Reserve Bank of India". Slides, Pics. March 2019: Our blog on "The #MainBhiChowkidar Campaign: 30% Verified, 36% non-verified Handles added Chowkidar to their Name". March 2019: Business Standard covers our work on MIME, a social network for MEME enthusiasts. 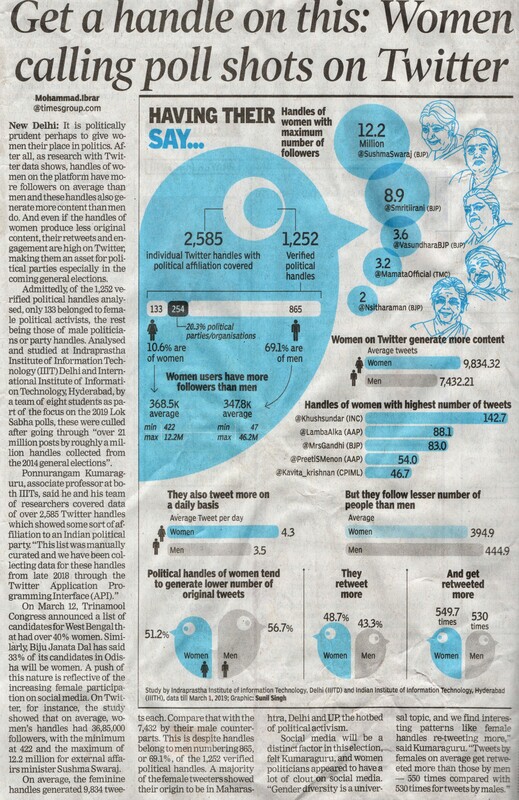 March 2019: The Times of India, Page 5, March 21 covered our work, "Get a handle on this: Women calling poll shots on Twitter". Physical paper. March 2019: PK gave a talk on #Elections2019 & KillFies at Shiv Nadar University as part of the National Seminar on Cybersecurity. Pics. March 2019: The Times of India, Page 2, March 9, "Battleground Twitter: Verified Political handles up 1,663% in 5 yrs." March 2019: Education Times, The Times of India, Page 2 March 4, 2019 covers our #WhatsFarzi "College Students develop an App to fight fake news"
February 2019: PK gave a talk on Social Media Risk Communication & #Elections2019 at IIT Madras as part of the WebScience Symposium. February 2019: Ayush Shah, #PrecogAlum blogs about his experience with us: "The Precog Land". January 2019: Vasundhara Ghosh, #Classof2018 blogs about her experience with us: "A Epistle open letter to Precog, PK & RK". December 2018: Shrey Bagroy, #Classof2018 blogs about his experience with us: "Life on the 4th Floor". December 2018: We are looking for interns for summer 2019, full time Research Associates, B.Tech. & M.Tech. thesis students, 1st & 2nd year students to join us. Apply here. November 2018: Kushagra Singh, #Classof2018 blogs about his experience with us: "class undergradAtPrecog(IIITD):". November 2018: Viraj Parimi, #ClassOf2019 blogs about his experience at CMU as part of Robotics Institute Summer Scholar(RISS): "A Summer to Remember". October 2018: Saksham Suri, #ClassOf2019 blogs about his experience at USC (Viterbi): "An Unforgettable Experience: Summer at USC". October 2018: Our Saftie Camera is live now! October 2018: Kushagra Bhargava, #PrecogAlum blogs about his experience with us: "A life that most Indian students couldn’t even imagine!". October 2018: Vedant Nanda, B.Tech. #ClassOf2019 blogs about his experience at MPI-SWS in Saarbrücken, Germany: "Internship at MPI-SWS and a summer to cherish". October 2018: Yashovardhan Sharma, #PrecogAlum, receives the Commonwealth Scholarship to study Ph.D. in the Department of Computer Science at University of Oxford. September 2018: Kushagra Bhargava, #PrecogAlum, is selected as a 2018 Youth@IGF Fellow to attend the Internet Governance Forum (IGF) in UNESCO Headquarters Paris, Nov 2018. September 2018: Kaustubh Welankar, B.Tech. #ClassOf2020 blogs about his experience with us: "A Summer at Precog". September 2018: Divyansh, who is joining CMU for his Masters, blogs his experience with us: "A tryst with Precog: My journey of 2 years, an adventure of a lifetime". 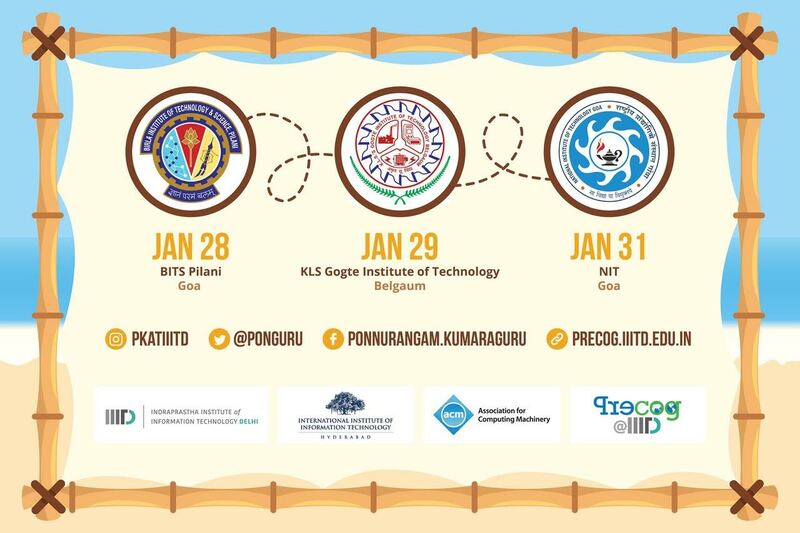 September 2018: Registrations are now open for "2nd Winter School on User Experience Design" at IIIT Hyderabad, co-organized by Precog! Click here to register. August 2018: Daksh Shah, B.Tech. #ClassOf2021 blogs about his experience with VideoLAN @GSoC: "My GSoC experience with VLC (macOS Interface Redesign)". August 2018: Our work on #WhatsApp #FakeNews got covered in The Times of India, The Economic Times, India Today, Outlook India.